The string-maker, or “cordaro” as it was first called in Italy, has been a profession since the 1600s. Violin strings can be made as a single filament or as a string core wound in wrappings. Though machines mostly do the labor now and new materials are used, the fundamental concept behind strings hasn’t changed much in the past four centuries. String cores can be solid steel or stranded steel, the latter of which is made of nylon filament, stainless steel or sometimes bronze, and gut. E-strings are typically made entirely of steel with no wrappings. The purpose of wrapping the string is to lower the pitch of the string by adding mass, as well as to protect the flexibility of the string core. Wrappings can be made of steel, silver, tungsten, copper, gold, or any combination. In addition to giving the string more elasticity, the wrappings add more tonal complexity to the string. Elasticity is necessary for the harmonics to be in tune and for the string to respond better to the bowing. Colored silk threads are often added to strings for aesthetic reasons and so violinists can tell the strings apart. The color on top delineates the type of string, and the color at the lower end tells the brand. 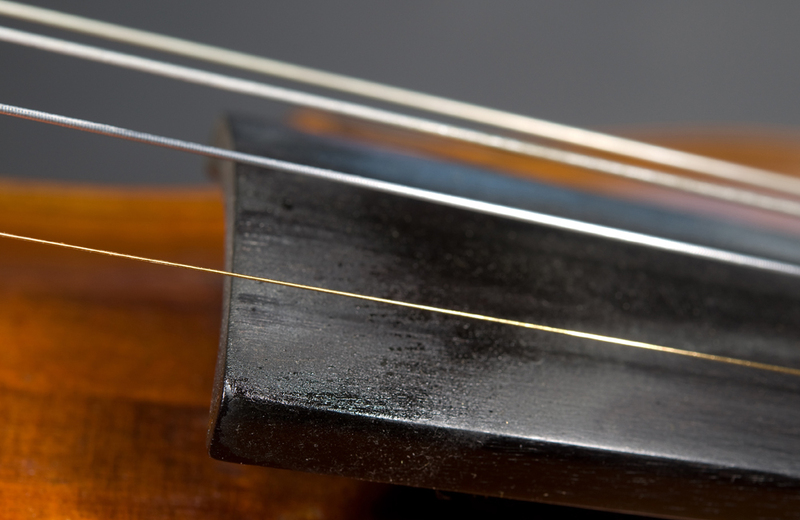 Traditionally, violin strings were entirely made from gut, or sheep or cattle intestines. The word “catgut” likely derives from “cattlegut” and is unrelated to cats. Though synthetic strings are now more common, some still prefer the darker, richer sound of gut. The natural fiber is found in the walls of intestines and can withstand high tension. Gut is prepared through a process of cleaning, freeing of fat and steeping in water. The intestines are then scraped of their external membrane, steeped in lye, sterilized with sulfuric fumes and then twisted into cords. Gut is also usually wrapped with silver or other alloys and then checked for pitch-correctness.